Birth-chart constants: Mercury or Uranus severely afflicted, and a planet afflicted in Sagittarius or less commonly Jupiter afflicted. Progressed constants: An affliction involving Mercury or Uranus, or an aspect involving Mercury or Uranus at the same time there are severe rallying forces, and an aspect involving a planet in Sagittarius, or less commonly involving Jupiter. Stellar Treatment: Sciatica is neuralgia, or if Uranus or Mercury is afflicted by Mars in the birth chart and there is a progressed aspect involving Mars, it may be neuritis, affecting the sciatic nerve. The treatment, therefore, should be the same as for neuralgia or neuritis except that the thought cells mapped by any planet in Sagittarius should be given the planetary energy of their antidote, and the zone occupied by Jupiter should be given Mercury planetary energy. Effort should be made to relieve any strain or pressure on the sciatic nerve. Sitting a long time on a hard chair, prolapsed abdominal viscera, enlargement of the prostate gland, standing too long at a time, or any other condition which brings pressure on the nerve may be a contributing cause. Rest in bed for a few days is helpful when strain due to working conditions is a contributing factor. Electromagnetic energy applied to the nerve is beneficial. Example: Chart 7285. Female, December 3, 1916, noon. 74W. 40:43N. Uranus semisquare Moon, Sun in Sagittarius sesquisquare Jupiter. In September 1940, with Mercury parallel Mars p, Uranus semisquare Mars r and Moon r, and Asc. trine Mercury r in Sagittarius, developed sciatica. Birth-chart constants: An upper-octave planet prominent and afflicted, Venus afflicted and Mercury afflicted. Progressed constants: An aspect involving an upper-octave planet, an aspect involving Venus, and an aspect involving Mercury, at the same time there are severe rallying forces. Stellar Treatment: The blisters form along the course of a sensory nerve. Nervous tension should be avoided, and calm, peaceful and optimistic thinking of the Jupiter type cultivated. The diet should contain calcium, vitamin B-1, vitamin D, vitamin A and vitamin E, iodine and copper. Wheat germ meal is a good source of vitamin E. Electromagnetic passes may be used to soothe the pain, which may continue after the blisters have disappeared. Saturn planetary energy should be applied to the zone occupied by Venus, the planetary energy of its antidote should be applied to the zone occupied by the afflicted upper-octave planet, and Jupiter planetary energy should be given the zone occupied by Mercury. If the blisters form on the eyelids or eyeball, the pupil should be kept dilated with atrophine and the eye bathed with boracic lotion under competent medical supervision. Example: Chart 7286. Female, February 9, 1906, 4:00 a.m. 121:14W. 50:42N. Uranus in an angle opposition Neptune, Venus and Mercury opposition Moon. In April 1923, as progressed, with Mercury parallel Venus p, Sun sextile Uranus p and trine Neptune r, Uranus opposition Neptune p, Neptune semisquare Moon r, and Uranus sesquisquare Moon r, had shingles. Birth-chart constants: An upper-octave planet prominent, Saturn or Jupiter afflicted, and commonly a planet in either Aries or Scorpio. Progressed constants: An aspect involving an upper-octave planet, an aspect involving Jupiter or Saturn, and an aspect involving the planet in Scorpio or Aries, at the same time there are severe rallying forces. Stellar Treatment: In addition to applying the planetary energy of its antidote to the zone occupied by the upper-octave planet, and to the zone occupied by Jupiter or Saturn and the planet in Scorpio or Aries, the diet should be such as to alkalize the blood stream and to correct the hypersensitivity. To do the latter it should contain calcium, vitamin B-1, and vitamin D. If Saturn is prominent and afflicted, the diet should contain variety in mineral salts. vitamins and proteins. If Jupiter is prominent and afflicted, care should be taken with sugar and fat, and the diet should contain sulphur. Nervous tension should be avoided, and calm and harmonious thinking cultivated. Example: Chart 307. Male, June 7, 1903, 4:43 p.m. 87:50W. 42N. Sun conjunction Pluto and opposition Uranus, Moon in Scorpio, Jupiter square Sun. May 8, 1929, as progressed, with Mercury conjunction Pluto p, M.C. sextile Moon r in Scorpio and opposition Jupiter r, and Saturn semisquare Uranus p, developed sinus trouble. Stellar Treatment: This unusual malady should not be confused with the sleeping sickness of Africa which is due to the parasite trypanosome. Yet that the sleeping sickness of America is induced by the invasion of some microorganism is indicated by the fact that when it occurs a progressed aspect involving Mars is present. This aspect also reduces the efficiency of the human chemical fighting apparatus. The diet should contain calcium, vitamin B-1, vitamin A, vitamin C, variety of mineral salts, especially iron, and variety of, but not too much, protein. Sun planetary energy should be applied to the zone occupied by Neptune, and solar electromagnetism should be applied to the patient to increase the vitality. Example: Chart 308. Male, May 17, 1913, 9:00 p.m. 98:30W. 45:30N. Neptune in an angle opposition Jupiter and square Venus. February 1, 1925, as progressed, with Mercury parallel Neptune p, Mars conjunction Jupiter p, and Sun conjunction Saturn p, became ill; went to sleep February 7, and slept 21 days. Stellar Treatment: This highly contagious disease is typical of Mars, and the more prominent Mars is the more likelihood of contracting it. Unsanitary conditions contribute to its power to afflict. To the extent the blood stream contains toxins, and there is too little adrenalin and cortin is it easy for the invading forces to gain a foothold. Few have a blood stream sufficiently pure, and the adrenal glands vigorous enough, to be free from risk through exposure to the disease. The food should not be stimulating, but productive of an alkaline reaction. Proteins and rich foods should be avoided. Fruit juices and vegetable juices are recommended. Moon planetary energy should be applied to the zone occupied by Mars, and Saturn planetary energy to the zone mapped by Venus. Lunar electromagnetic energy may be used to reduce the fever. As excitement and activity increase the toxic condition of the blood stream, and thus give adrenalin and cortin additional work, they should be avoided. Good nursing is unusually important. Example: Chart 7287. Male, October 19, 1914 6:20 a.m. 117W. 47N. Mars in an angle conjunction Moon and Mercury. Venus semisquare Sun. In October 1925, as progressed, with Mercury conjunction Mars p, M.C. square Mars r, Sun semisextile Venus r, and Venus semisquare Sun r, had small pox. 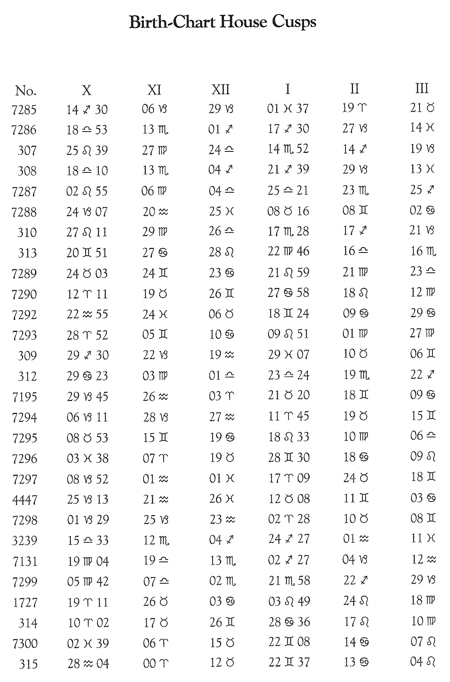 Birth-chart constants: The Sun afflicted by Saturn or a planet in Leo afflicted by Saturn. Progressed constants: An affliction involving the Sun or an affliction involving a planet in Leo. Stellar Treatment: Treatment depends on the cause. When the back is very weak a support may be needed part of the day. In some forms much may be done by lengthening a leg by a high-heeled boot, or by similar corrective measures. If the curvature is due to rickets, the treatment should include that for rickets, if due to tuberculosis or cancer, the treatment should include treatment of such disease. But in addition, the zone occupied by Saturn should be given Venus planetary energy, the Sun if afflicted by Saturn should be given Jupiter planetary energy and if there is a planet in Leo afflicted by Saturn, the zone it occupies should be given the appropriate planetary antidote. The diet should contain ample variety of vitamins, mineral salts and proteins. Example: Chart 7288. Female, December 15, 1920, 2:00 p.m. 118:15W. 34N. Neptune in Leo opposition Moon and Mars. Sun square Saturn. At, or soon after birth, as progressed, with Saturn square Sun r, and Mars opposition Neptune r in Leo, had spinal curvature; grew up to be a hunchback. Birth-chart constants: An upper-octave planet prominent, Sun afflicted, and Mars afflicted or a planet in Aries afflicted. Progressed constants: An aspect involving an upper-octave planet, an aspect involving the Sun, and an aspect involving Mars or a planet in Aries, at the same time there are severe rallying forces. Stellar Treatment: Meningitis may follow infectious fever, blood poisoning, or injuries to the skull which become infected. The ear in particular is a common site of its origin following its inflammation or the decay of the adjacent bone. From the brain the infection may spread to the meninges of the spinal cord. Rest and confinement to bed are essential. An ice bag on the head and tepid baths may be used to reduce the fever, together with lunar electromagnetic energy. Penicillin may be used by a doctor to destroy the infection. Diet should be fruit juices and vegetable juices to alkalize the blood stream. Vitamin B-1, vitamin D and calcium are needed in the diet. The zone occupied by Mars should be given this planet’s antidote planetary energy, and its antidote planetary energy should be applied to the zone occupied by the significant upper-octave planet. Example: Chart 310. Male, June 6, 1898, 5:15 p.m. 94:40W. 39N. Pluto and Uranus in angles, Mars in Aries square Moon and semisquare Sun. In December 1900, as progressed, with M.C. trine Mars r in Aries, Mars inconjunct Uranus r and semisquare Sun r, had spinal meningitis. Birth-chart constants: An affliction to either Sun or Saturn, often Sun afflicting Saturn. Progressed constants: An affliction involving Sun or Saturn, or afflictions involving both. Stellar Treatment: The zone occupied by Saturn should be given the planetary energy of Venus and the zone occupied by the Sun should be given the planetary energy of Jupiter. The spleen should be thoroughly and repeatedly charged with solar electromagnetic energy, taking pains to seal it in with a motion of the hand to prevent it oozing out before used. As there is usually a contributing disease of some recognized type, this should receive the treatment advocated for it. Example: Chart 313. Female, January 23, 1891, 9:00 p.m. 17E. 49N. Sun sesquisquare Saturn, square Uranus, and semisquare Venus. Saturn conjunction Asc. and opposition Mars. In April 1921, as progressed, with Mars parallel Saturn p, Asc. semisextile Saturn r, and Sun square Neptune r, developed hardening of the spleen. Stellar Treatment: When the sudden overstretching of a muscle or ligament stops before actually tearing it is called a strain; when there is tearing it is called a sprain. In either case first-aid treatment consists of rest and cold applications and a firm, smooth bandage. Later, heat may be applied to relieve the pain, alternating with lunar electromagnetic energy. Movements that cause dragging on the injured muscle should be avoided, but the joint should be moved gently from the first, and after a few days through its whole range, to prevent the scar tissue forming adhesions. In a few days if there is no acute inflammation massaging will prove beneficial. Electromagnetic passes over the injured part should then also be used. Moon planetary energy should be applied to the zone occupied by Mars. Example: Chart 7289. Male, April 13, 1895, 2:00 p.m. LMT. 61:18 W. 10:27N. Mars sextile Sun and opposition Moon. In September 1908, as progressed, with Mars conjunction Jupiter p, trine Saturn p in Scorpio, and sesquisquare Uranus p in Scorpio, sprain caused swollen and painful testicles. Birth-chart constants: An aspect between Mercury and Uranus, usually an affliction. Progressed constants: An aspect involving Uranus at the same time there are severe rallying forces. Stellar Treatment: There is a conflict of mental factors which should be reconciled. Psychoanalysis may be used to reveal the conflict, and to point the way to the reconciliation. Calm and unhurried thinking of the Jupiter type should be cultivated. All stress on the nervous system should be avoided. Relaxation through mild recreation is advisable. The diet should contain calcium, vitamin B-1 and vitamin D. The zones occupied by Mercury and Uranus should be given Jupiter planetary energy. Thought treatment and suggestion may be used to reduce the nervous tension and reharmonize the conflicting mental factors. Everything tending toward excitement should be avoided. Example: Chart 7290. Female, April 21, 1917, 10:45 a.m. 74:11W. 40:44N. Mercury square Uranus. In June 1922, as progressed, with Mars sextile Uranus p, and square Saturn p, developed St. Vitus Dance. Progressed constants: An aspect involving Mercury at the same time there are severe rallying forces, especially if Uranus is involved. Stellar Treatment: Stuttering is due to anxiety hysteria. When the conflicting mental factors are reconciled the stuttering will cease. Psychoanalysis may be used to reveal the cause of the anxiety, and suggestion and thought treatment to alleviate it. Voice exercises and breathing exercises may help through giving the individual confidence. Jupiter planetary energy should be applied to the zones occupied by Mercury and Uranus. Example: Chart 7292. Male, March 25, 1925, 10:05 a.m. EST. 83:33W. 41:39N. Uranus in an angle, Mercury square Jupiter. He was in the habit of using both hands with equal facility. In September 1931, as progressed, with Mercury sextile M.C. p, Uranus semisextile Mercury r, and Sun square Pluto p, he started going to school, and there was coerced (Pluto) into using only his right hand. He then commenced to stutter. Birth-chart constants: Mars afflicted and a planet in the twelfth house, or the ruler of the twelfth house heavily afflicted. Progressed constants: An aspect to the ruler of the twelfth house at the same time there are severe rallying forces. Stellar Treatment: Through education in the true purpose of life desire should be built up in the individual with a predisposition toward suicide to see life through regardless of its difficulties. He should be made to realize he cannot escape difficulty by running away from physical life. Courage should be developed to face any situation, to place trust in higher powers, and he should be convinced he is a significant factor in the universal scheme. He should cultivate Jupiter type thinking. Suggestion and the thought treatment should have for object reconciling the mental conflicts which tend toward despondency or impulse to violence. Moon planetary energy should be applied to the zone occupied by Mars, and its planetary antidote should be given the zone of the afflicted ruler of the twelfth house. Example: Chart 7293. Male, June 22, 1884, 7:30 a.m. 86:12W. 39:47N. Mercury and the Moon conjunction Saturn, Mercury and Saturn square Mars, Moon coruler of twelfth. On July 14, 1945, as progressed, with Saturn conjunction Moon r, ruler of twelfth, Mars trine Saturn r and sesquisquare Pluto r, Asc. and Mercury conjunction Uranus p, and M.C. square Uranus p, deliberately shot himself through the head with a revolver and died. Birth-chart constants: Watery planets, chiefly Neptune or the Moon, prominent and afflicted, often an affliction in Aries. Progressed constants: An aspect, usually an affliction, involving the Sun, and an aspect, usually an affliction, involving Mars. Stellar Treatment: The same conditions develop in furnace workers and those in glass works, laundries, etc., where the heat is great, as with those who suffer from the direct rays of the Sun. The salt balance should be reestablished by the individual drinking water containing some salt. He should be taken into the shade or as cool a place as possible and head and body soused with cold water. If, as usual, the temperature is high, ice packs or bath, together with lunar electromagnetic energy, should be used to lower it. If, instead, the skin is cool and pale and the temperature subnormal, a hot bath, or hot water bottles, together with solar electromagnetic energy, should be used after he has been put to bed. Fruit juices and vegetable juices should constitute most of the diet. The throbbing in the head may be relieved by cold packs and electromagnetic passes from the top of the head downward. Example: Chart 309. Male, April 17, 1873, 4:15 a.m. 122W. 38N. Sun conjunction Neptune in an angle in Aries, and both square Uranus. Moon square Asc. In August 1898, as progressed, with Sun square Jupiter r, and Mars square Uranus r and square Saturn r, suffered sun stroke. Birth-chart constants: Venus or Mars, usually both, afflicted, and especially an affliction between Mars and Venus. Stellar Treatment: The medical profession treats this disease successfully with penicillin. Highly seasoned and spicy foods should be avoided, also strain and excitement. There should be vitamin A, vitamin E, iodine, copper, vitamin B-1, vitamin C, iron and variety of, but not too much, protein. The utmost in cleanliness should be observed. The zone occupied by Venus should be given Saturn planetary energy, the zone occupied by Mars should be given Moon planetary energy, there should be exercise enough to insure elimination, and electromagnetic energy should be employed to build up the vitality. Example: Chart 312. Male, January 18, 1889 11:50 p.m. 99:50W. 47N. Mars conjunction Venus and sesquisquare Uranus and Asc. Venus semisquare Sun. In June 1919, as progressed, with Asc. sesquisquare Mars p and inconjunct Venus p, Uranus sesquisquare Mars r, Mars sesquisquare Saturn p, and Sun square Neptune r, contracted syphilis. Birth-chart constants: Venus or Jupiter afflicted, and Pluto. Neptune or Saturn prominent and afflicted. Progressed constants: An affliction involving Venus or Jupiter at the same time there is an aspect involving Pluto, Neptune or Saturn, and an aspect involving Mars. Stellar Treatment: Venus rules the veins and the venous blood. Jupiter rules the arteries and the arterial blood. The cause of thrombosis (plugging of a blood vessel) is a marked change in the circulation or an injury to the walls of the blood vessels. An affliction to Pluto or Neptune decreases the adrenalin and cortin supply, an affliction to Saturn exhausts the adrenalin supply; and especially if there is a depleted condition, lack of adrenalin may slow down the circulation markedly. But under the influence of the progressed Mars aspect there may be bacterial infection, temporary irritation and excitement, a toxic condition, or a spurt of exertion, which releases adrenalin. Adrenalin, as well as certain bacteria, has a tendency to cause blood to clot; and released at a time when the circulation markedly alters, a blood clot may form either in the veins or in the arteries. This clot may cut off nutriment from a given area of the body. Lodging in the heart it may cause death, in the brain some degree of paralysis may result. Through diet and application of Sun planetary energy to the zones occupied by Venus and Pluto, Neptune or Saturn, the vitality should be increased. Mercury energy should be given the zone occupied by Jupiter, and Moon energy to the zone occupied by Mars. Example: Chart 7195. Male, March 23, 1898, 7:54 a.m. 87:39W. 41:52N. Venus opposition Jupiter, Pluto and Neptune opposition Saturn. 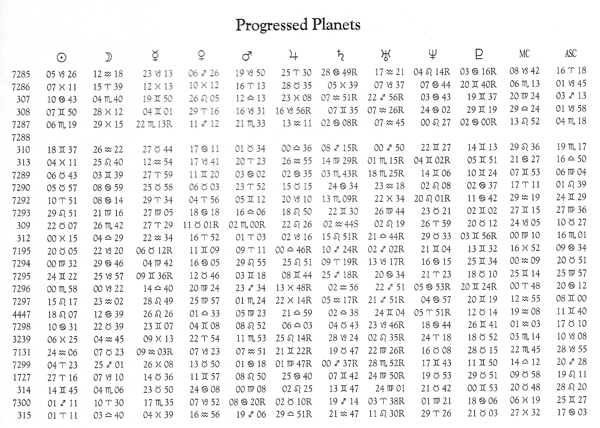 June 3, 1946, as progressed, with Venus opposition Saturn p, Sun sesquisquare Jupiter r, Mars square Asc. p, and Asc. square Mercury r, was taken to hospital where later little finger (Venus p in Gemini) on right hand was amputated. Depletion and low blood pressure preceded thrombosis which blocked blood supply to arm, causing little finger to turn black. Progressed constants: An aspect involving Mars and an aspect involving Neptune, at the same time there are severe rallying forces. Stellar Treatment: The microorganism which causes this disease is carried by ticks or other parasitic insects. This virulent disease is now successfully treated in hospitals with streptomycin. The fever, which runs very high and then suddenly falls, and continues to repeat this process, may be relieved by ice packs, sponging in tepid water, and lunar electromagnetic energy. As in other infectious fevers, complete rest in bed is advocated, and a diet to alkalize the blood stream, chiefly fruit and vegetable juices. The zone occupied by Neptune should be given Sun planetary energy, and the zone occupied by Mars should be given Moon planetary energy. The vitality should be reinforced by electromagnetic passes. Good nursing is important. Example: Chart 7294. Male, July 29, 1908, 10:00 p.m. 90:40W. 40:27N. Neptune in an angle conjunction Mercury and square Saturn and the Asc. Mars conjunction Sun and Moon, and inconjunct Uranus. On July 15, 1933, as progressed, with Sun conjunction Mars p, Venus conjunction Neptune p, and Mars and Sun semisquare Neptune r, was bit by tick and a few days later developed tick fever. Birth-chart constants: Pluto, Neptune or Saturn prominent at the same time either Venus or a planet in Taurus is afflicted. Progressed constants: An aspect involving Mars, an aspect involving Pluto, Neptune or Saturn, at the same time there is an aspect involving Venus or a planet in Taurus. Stellar Treatment: The influence of Pluto and Neptune depress the manufacture of adrenalin and cortin, and the influence of Saturn tends to exhaust the adrenalin supply. The blood stream becomes acid, and under the Mars influence adrenalin and cortin are exhausted, and inflammation or infection develops. It attacks the tonsils because of the Venus or planet in Taurus affliction. The blood stream should be alkalized with a diet chiefly of fruits and vegetables. The diet should contain vitamin A, vitamin E, iodine, copper, iron, calcium, vitamin C and vitamin B-1. Sun planetary energy should be applied to the zone occupied by the significant negative planet and to the zone occupied by Venus. Its antidote planetary energy should be applied to the zone occupied by any planet in Taurus. Electromagnetic energy should be applied to the region of the tonsils. Example: Chart 7295. Female, April 28, 1870, noon. 84:30W. 42:30N. Saturn square Venus, Sun in Taurus conjunction Pluto and Mars. Neptune conjunction Moon. Had much trouble with tonsils until they were removed in July 1918, as progressed, with Mars semisquare Uranus r, Venus sesquisquare Saturn r, and Pluto in Taurus sextile Uranus r.
Birth-chart constants: Saturn prominent and afflicted, and an upper-octave planet prominent. Progressed constants: An aspect involving Saturn and an aspect involving Mercury or an upper-octave planet at the same time there are severe rallying forces. Stellar Treatment: The normal action of the parathyroid glands is essential to maintaining good teeth. Therefore the diet should contain calcium, vitamin B-1 and vitamin D. Nervous stress and strain should be avoided, and harmonious Jupiter thinking cultivated. Also, to maintain good teeth, there should be variety of vitamins, variety of minerals and variety of proteins. Poor teeth indicate either something is lacking in the diet, or that it cannot be properly handled. Venus planetary energy should be applied to the zone occupied by Saturn, and its antidote planetary energy should be applied to the zone occupied by Mercury or the significant upper-octave planet. Worry, fear and anxiety contribute to poor teeth by interfering with the action of the Saturn growth hormone of the front pituitary gland. Example: Chart 7296. Female, September 27, 1903, 9:45 p.m. 71:25W. 41:49N. Saturn trine Sun and sesquisquare Venus. Neptune in an angle square Sun. Had neuralgia headaches from bad teeth until in March 1931, as progressed, with Saturn sesquisquare Venus r, trine Sun r and Mars r, Mars conjunction Uranus p, Mercury semisquare Moon r, and Venus square Pluto r, had all her upper teeth removed. Progressed constants: An aspect involving Saturn and an aspect involving Mars, at the same time there are severe rallying forces. Stellar Treatment: This disease is secondary to infection of the teeth and gums by a bacillus. Doctors advise massaging the gums with sodium perborate and gargling the throat with antiseptic solution. The diet should be such as to alkalize the blood stream and to strengthen the production of adrenalin. It should contain vitamin A, vitamin B-1, vitamin C, iron, and a wide variety of other vitamins, mineral salts and proteins. The zone occupied by Mars should be given Moon planetary energy, and the zone occupied by Saturn should be given Venus planetary energy. Example: Chart 7297. Female, July 3, 1403, 11:45 p.m. 87:39W. 41:52N. Saturn trine Moon, semisquare Jupiter and semisquare Uranus. Mars square Sun and opposition Asc. On May 4, 1940, as progressed, with M.C. trine Mars r, Jupiter sesquisquare Moon r and semisquare Saturn r, and Saturn sesquisquare Mercury r, developed trench mouth. Birth-chart constants: Saturn, Neptune, Jupiter and Pluto prominent and usually afflicted. Progressed constants: An aspect involving Saturn, an aspect involving Jupiter, an aspect involving Neptune, and often an aspect involving Pluto, at the same time there are severe rallying forces. Stellar Treatment: The analysis of the charts of 100 people progressed to the time tuberculosis developed, and the details of precautionary measures and treatment are given in the reference book, BODY DISEASE AND ITS STELLAR TREATMENT. Even when the disease is in an advanced stage, other than taking care of the cavities, if these have developed, the outstanding problem presented in tuberculosis infection is to build up a physical vitality so vigorous that the body can heal the attacked tissues and prevent further infection. Fresh air, sunlight, moderate exercise, rest from hard work, and nourishing foods are important. The food should contain a wide variety of vitamins, mineral salts and proteins. The thinking is very important also, and the type should be cultivated which will give greater activity to Sun thought cells. Negative thinking should be avoided. The zones of the constants should be treated with the proper planetary antidotes, and solar electromagnetic energy should be applied to build up positiveness and vitality. Example: Chart 4447. Male, July 17, 1863, 12:10 a.m. 122W. 38N. Mercury square Saturn, Sun square Jupiter, Mercury square Neptune, Pluto conjunction Asc. In July 1888, as progressed, with Sun semisquare Saturn p, Sun sextile Jupiter r, Mars inconjunct Neptune p, and Pluto conjunction Asc. r, developed tuberculosis. Birth-chart constants: Jupiter, Saturn, Neptune and the Moon prominent and often afflicted. Progressed constants: A progressed aspect involving Jupiter and a progressed aspect involving Saturn. Stellar Treatment: Although the progressed aspects at the time are usually more severe when cancer develops, especially the one involving Saturn, it is difficult from the astrological constants to determine whether the predisposition is merely toward benign growths or toward those more malignant. The constants for tumors of all kinds indicate an acid blood stream, and one filled with toxins. The Jupiter influence tends to cause the blood stream to be filled with incompletely burned fuel, and an excess of fat which may be deposited as a fatty tumor. Saturn rules the growth hormone of the front pituitary gland, and when afflicted may promote abnormal growths. The diet should be such as to alkalize the blood stream and furnish it with not too rich foods, but those containing a wide variety of vitamins, mineral salts and proteins. The thinking should avoid negative conditions and emotional discords, and should include harmonious Sun type thinking. The energy of its planetary antidote should be applied to the zone occupied by each birth-chart constant. Example: Chart 7289. Female, June 2, 1910, 1:15 a.m. 117:05W. 33:07N. Jupiter in an angle opposition Asc., Saturn in an angle square Moon, Neptune in an angle opposition Uranus. May 20, 1941, as progressed, with Venus trine Jupiter r, semisextile Saturn p, and semisquare Mars r, and with M.C. square Saturn r, a benign tumor was removed surgically. Birth-chart constants: Mars rather severely afflicted. Saturn, Neptune or Pluto prominent increases the predisposition. Progressed constants: An aspect involving Mars, an aspect involving Mercury or a planet in Virgo, and usually an aspect involving Saturn, at the same time there are discordant rallying forces. Stellar Treatment: The analysis of the charts of 100 people progressed to the time they had typhoid fever, and the details of treatment and precautionary measures, are given in the reference book, BODY DISEASE AND ITS STELLAR TREATMENT. As the blood stream is already filled with toxic acids, it is obvious that the diet should tend toward neutralizing this condition by tending toward the alkaline. Any physical exercise results in acid products of combustion entering the blood stream, therefore the patient should be kept lying down, but turned from side to side on his back every few hours to prevent the development of bed sores. The mouth should be cleansed frequently with water, boric glycerin or listerine. Water should be taken copiously. Fruit and vegetable juices should be the chief diet until the patient is strong enough to handle foods more substantial. Then, to strengthen the adrenal glands, it should contain vitamin A, vitamin B-1, vitamin C, iron and variety of proteins, but little meat. The zone occupied by Mercury should receive Jupiter planetary energy, the zone occupied by the significant negative planet, and the zone occupied by any planet in Virgo, should receive the planetary energy of the appropriate antidote. Good nursing is important. Example: Chart 3239. Male, February 7, 1873, 3:47 a.m. 84:50W. 38:45N. Mars in an angle square Neptune, Pluto square Sun. In August 1890, as progressed, with Sun trine Mars r, Mercury semisquare Neptune p, and Saturn inconjunct Jupiter r, had typhoid fever. Birth-chart constants: Mars and Uranus afflicted and Saturn, Neptune or Pluto prominent and usually afflicted. Progressed constants: An aspect involving Mars, an aspect involving Uranus, and an aspect involving Saturn, Neptune or Pluto, at the same time there are severe rallying forces. Stellar Treatment: Ulcers fall into three main groups, those due to some kind of irritation, those due to microorganisms, and those due to malignant new growths. In either group nutritional deficiencies contribute to keep it going, and usually contribute to its origin. Those due to microorganisms are now successfully treated with penicillin. The floor of the ulcer should be kept antiseptic. But after the microorganism has been eradicated by the penicillin, as with the other two groups, there is need to build new and healthy tissue. For this purpose the food should be ample and nourishing, but with plenty of vegetables and fruits to alkalize the blood stream. It should contain variety of vitamins, mineral salts and proteins, especially vitamin A, vitamin B-1, vitamin C, and iron. The vitality should be increased through giving the patient solar electromagnetic energy. Moon planetary energy should be applied to the zone occupied by Mars, Jupiter planetary energy should be applied to the zone occupied by Uranus, and the planetary energy of its antidote should be applied to the zone occupied by the significant negative planet. Example: Chart 7131. Male, December 12, 1882, 5:55 a.m. 94W. 41:37N. Mars in an angle square Uranus, Saturn inconjunct Sun, Neptune inconjunct Mercury, Pluto sesquisquare Moon. July 22, 1945, as progressed, with Mars sesquisquare Uranus r, Sun inconjunct Uranus r, Mercury sesquisquare Uranus r, and Asc. trine Pluto r, started to develop a serious ulcer on his right thigh. Progressed constants: An aspect involving Mars and a progressed aspect involving the Moon, at the same time there are serious rallying forces. Stellar Treatment: As this disease is caused by Bacillus abortus, and the similar disease, Malta Fever, is caused by a germ, Alcaligenes melitensis, both found in goat’s milk, precautionary action consists of either refraining from goat milk, or boiling it for 20 minutes to destroy the infection. At the onset the fever gets a little higher each day for about seven days, then gradually subsides to normal, but after two or three weeks the process is repeated, and thus recurs for a few months up to two years. The medical profession now treats this disease by administering streptomycin and sulfadiazine simultaneously. Otherwise, it should be treated as are other fevers. There should be rest, and sponging and lunar electromagnetic energy to keep the fever down. The diet should be such as to alkalize the blood stream, and to reinforce the adrenalin glands. It should contain vitamin A, vitamin B-1, vitamin C, iron and variety of proteins, but not too much protein. The zone occupied by Mars should be given Moon planetary energy, and the zone occupied by the Moon should be given Mars planetary energy. Example: Chart 7299. Male, February 14, 1897, 1:30 a.m. EST. 84:33W. 43N. Mars in an angle conjunction Neptune and Pluto and sesquisquare Mercury. Moon square Venus and sesquisquare Uranus. In August 1935, as progressed, with Mars sextile Jupiter p, and inconjunct Saturn p, and Jupiter semisquare Moon r, had undulant fever. Birth-chart constants: A planet afflicted in Scorpio, or an affliction to Mars or Venus, especially if the Moon is afflicted. Progressed constants: An aspect, usually an affliction, involving a planet in Scorpio, or involving Mars or Venus, especially if the Moon is also involved in an aspect. Stellar Treatment: The Moon has considerable influence over the feminine cycles through its influence on a back pituitary hormone which causes the cavity where the follicle is ruptured when the egg matures to be transformed into the corpus luteum which secretes another hormone called progestin. Progestin has successfully been used to overcome sterility in women when due to insufficient development of the organs involved. It prepares the lining of the womb for the fertilized egg. If the Moon is afflicted, the zone it occupies should be given Mars planetary energy. Usually difficulty with the uterus is due to the thought cells mapped by Venus or Mars. If there is a planet in Scorpio, especially if afflicted, any difficulty is more likely to affect the uterus than it otherwise would. Electromagnetic energy should be applied to the region. The planetary energy of its antidote should be applied to the zone occupied by any planet in Scorpio, Saturn planetary energy should be applied to the zone occupied by Venus, and Moon planetary energy should be applied to the zone occupied by Mars. Vitamin A, vitamin E, and iron are especially important. Insufficiency of one of these will seriously affect menstruation. The diet should also contain iodine, copper, vitamin B-1, vitamin C and variety of protein. Example: Chart 1727. Female, March 26, 1884, 12:40 p.m. 71:53W. 42:03N. Sun, Moon and Mercury semisquare Venus, Mars conjunction Asc., Moon opposition Uranus. May 20, 1905, as progressed, with Asc. square Venus r, Mars semisquare Uranus p, and Pluto sextile Moon r, underwent operation to correct inverted uterus. Progressed constants: An aspect involving Venus at the same time there are severe rallying forces, especially involving Mars. Stellar Treatment: This difficulty is often brought on through the strain of constant standing, or in women through pregnancy. The afflictions involving Venus cause the irritants in the blood stream to weaken the walls of the veins. The chemical imbalance encouraged by Venus is due to imperfect functioning of the thyroid and gonad glands. But very frequently the other planets afflicted encourage toxins to accumulate in the blood which, under the progressed aspect involving Venus, cause the veins to become dilated and tortuous. The diet should favor Venus, including vitamin A, vitamin E, iodine and copper. Wheat germ meal is an excellent source of vitamin E. The diet should also be such as to alkalize the blood stream and free it from irritants. Emotional stresses should be avoided, and a poised attitude cultivated. Saturn planetary energy should be given the zone occupied by Venus, and each group of thought cells contributing to the toxic blood stream should receive its appropriate planetary energy antidote. Example: Chart 314. Female, April 23, 1884, 10:40 a.m. 123W. 44:30N. Venus semisquare Sun and square Uranus. In July 1926, as progressed, with Venus sextile Mercury r and sextile Uranus r with Sun conjunction Saturn p, and with Mars square Pluto r, varicose veins caused severe trouble. Birth-chart constants: Pluto, Neptune or Saturn prominent, and Mercury or a planet in Gemini afflicted. Progressed constants: An aspect involving Mars, an aspect involving Mercury or the planet in Gemini, and usually an aspect involving Saturn, Neptune or Pluto. Stellar Treatment: This is a contagious disease more readily contracted in the presence of a common cold. The Mercury, Pluto or Neptune aspect tends to cause deficiency of parathyrin, resulting in hypersensitivity of the membranes of the throat and bronchi. The Mars influence tends to exhaust both adrenalin and cortin, the Saturn influence exhausts adrenalin, Pluto and Neptune depress the manufacture of adrenalin and cortin. Infection is thus facilitated. There is an accumulation of tough, tenacious mucus in the throat which causes the cough. This may be severe enough either to cause collapse of some portion of the lungs, or the dilation of the air cells accompanied by shortness of breath. The diet should alkalize the blood stream. For this purpose fruit and vegetable juices are excellent. To combat the hypersensitivity of the membranes the diet should contain vitamin B-1, vitamin D and calcium. The zone of the significant negative planet should be given the planetary energy of its antidote, the zone occupied by Mercury should be given Jupiter planetary energy, the zone occupied by the planet in Gemini should be given the planetary energy of its antidote, and the zone occupied by Mars should be given Moon planetary energy. Example: Chart 7300. Male, November 19, 1928, 6:16 p.m. 118:15W. 34N. Mercury square Moon, Asc. in Gemini opposition Saturn, Pluto trine Mercury, Neptune square Sun. July 4, 1932, as progressed, with Pluto trine Mercury r, Sun square Neptune r, and Venus opposition Mars p, developed whooping cough. 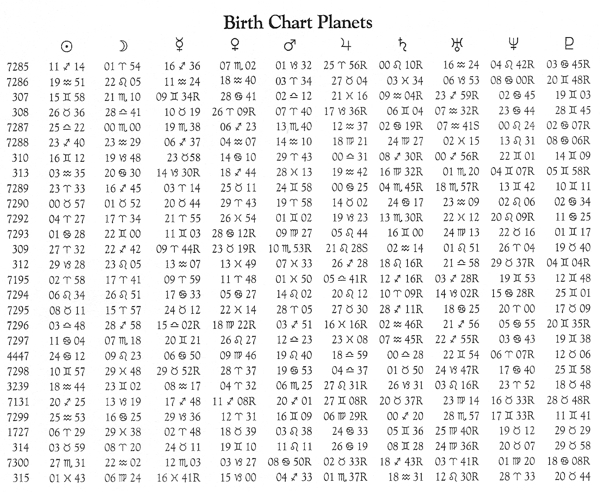 Birth-chart constants: Mars afflicted and prominent, and Saturn, Neptune or Pluto prominent. Progressed constants: An affliction involving Mars at the same time Saturn, Neptune or Pluto are involved in an aspect. Stellar Treatment: This disease is caused by the invasion of the blood stream by a virus through the bite of the Stegomyia mosquito. Cold sponging, ice packs and lunar electromagnetic energy should be used to keep the fever down. To alkalize the blood stream, the diet should be chiefly fruit and vegetable juices, with vitamin B-1, vitamin C and iron to assist the adrenal glands produce adrenalin and cortin to fight the infection. Through positive Sun thinking, through the application of electromagnetic energy, and through the application of Sun planetary energy to the zone occupied by the significant negative planet, every effort should be made to build up the vitality and help the body chemicals overcome the invading organism. The patient should rest, and be kept free from excitement and stimulating food. Example: Chart 315. Male, February 20, 1875, noon. 82:45W. 40:45N. Mars square both Sun and Moon, Neptune semisquare Mercury, Pluto square Saturn. In August 1904, as progressed, with Mercury square Mars r, Saturn square Pluto p, Jupiter opposition Neptune p, and Mars sextile Saturn r, had yellow fever.